I was having a fairly rough day. A possible promotion at work fell through, severe car troubles were bound to be right around the corner, and it was drizzling. Not raining … drizzling. I decided to ignore the irritating weather conditions and go for a walk to browse some shops and clear my head. Then I saw John, a tall man wearing a safety orange construction vest riding toward me on a bicycle. His long, wiry beard was flowing in the breeze, slightly damp from the rain. I noticed a sign strapped to the rusty handlebars. 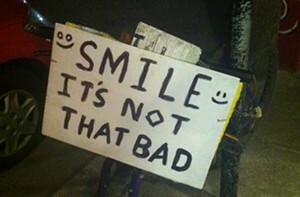 It read: "Smile. It's Not That Bad," with smiley faces lining the edges of the cardboard. I knew I needed to find out more behind the philosophy of this mysterious man. Time slipped away quickly, and it started to seem impossible to find the mysterious homeless man who drifted around the streets of Richmond, spreading happiness with his simple, uplifting sign. Then one night I stumbled out of my favorite bar on Lombardy Street to find the exact same bike chained to a nearby light post. And there he was, wearing the same vest and a huge grin. I made this sign because I noticed that there are too many people that whine about their life all of the time. They complain and complain, but they don't do anything to change and fix what's wrong. It's because they're upset and worrying about nothing, they're just sweating the small stuff. Whenever you're down, just smile, because most of the time things just aren't that bad. You've got to keep your head up and look at what's ahead, not what's happened. People look at me and think that my life must be bad. But what they don't realize is that no matter what happens, I make sure I keep ahold of my happiness. It's the one thing no one can ever take away from you. Just make sure you keep on smiling. The joyous soldier of optimism hopped on his bike and rode away, shrinking smaller and smaller under the flickering streetlamps. But I could still see that his smile was always intact.